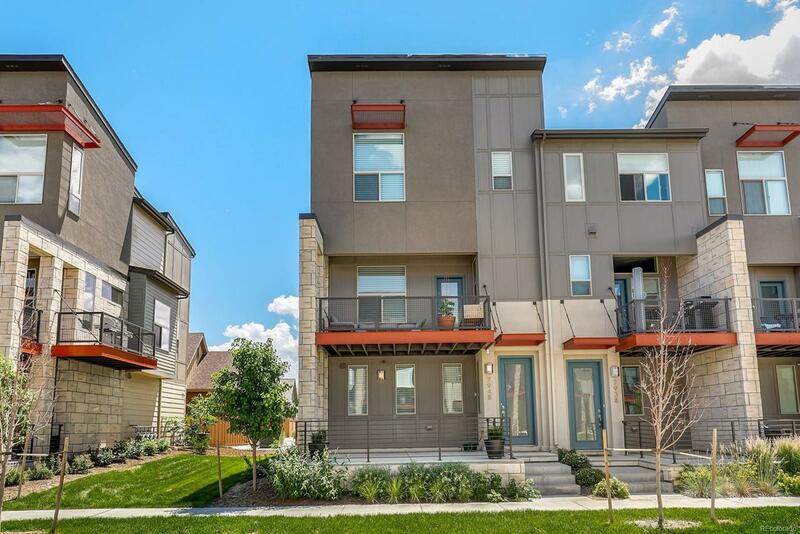 Immaculate 2 beds/2.5 bath + loft contemporary townhome in N. Denver's emerging Conservatory/Northfield area! Boasting downtown Denver skyline and mountain views from upper level, and at just steps to numerous parks! This beautiful property is filled to the max with stylish upgrades and details. Open main level is anchored by a sleek kitchen, with granite countertops, 42" cabinets, glass-tile backsplash and eat-in island. Owner's Retreat enjoying Flatirons view, walk-in closet, 5-pc en-suite bath and 10 ft ceilings. Bright loft and 2nd bedroom both with city and Front Range views. Custom window treatments, cozy tech nook, East-facing balcony and concrete front patio. Ample garden level mud room, laundry room and 2-car garage. The incredible location is within 1/2 mile to RTD and 3 miles to light rail. Close to the new Punch Bowl Social, walking distance to Northfield Shops and restaurants. Quick access to Quebec ST, I-270 and I-70! This is "The Must See" on your list!